Yesterday’s price action produced a wide spread up bar but once again we saw the $99 price level coming into play and this is now increasingly providing a level of resistance which we have seen again this morning with prices falling back. The break above the $100 psychological level is still not a “done deal” and my advice therefore remains the same as yesterday, in that we need to see a breakout above this region before entering any longer term positions. Whilst the moving averages are all acting as support and suggesting a move higher I would still take a “wait and see approach” not least because this morning’s prices have failed to move through the $99 level. My longer term view is that the pair remain bullish and the daily chart will provide our entry point at some stage for our next trading position. Later today there are 2 items of fundamental news due for release in Japan. The first of these concerns core machinery orders which are based on the change in the total value of new private sector purchase orders placed with manufacturers for machines. The data excludes major items, such as ships and utilities and is generally considered a leading indicator of production. If the actual is better than forecast then this is generally good for the home currency, in this case the Japanese Yen. The forecast this time around is -4.9% against a previous of -1.7%. The day rounds off with some data from the Bank of Japan which is called the corporate goods price index (CGPI) – sometimes called the domestic CGPI and measures changes in the price of goods sold by corporations. Again it is considered a leading indicator of consumer inflation as higher costs are generally passed to the consumer directly. 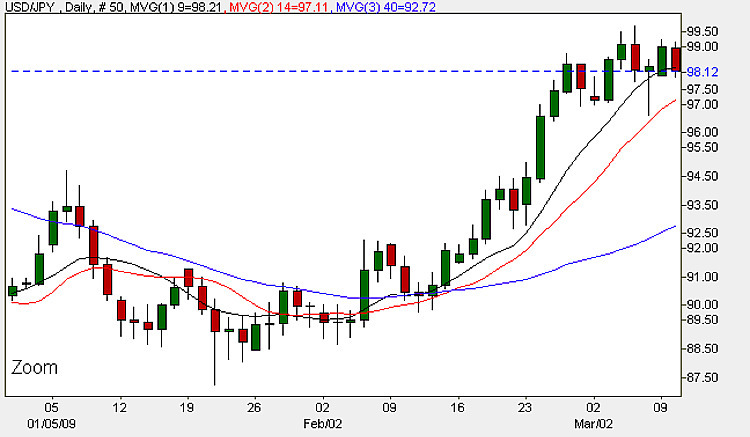 If the actual is better than forecast then again this is generally good news for the Japanese Yen. The forecast is for -1.3% as opposed to a previous of -0.2%. I have added several new services to the site. First there is an economic calendar which provides fundamental news items from around the world, including details of forecasts and previous figures. If you prefer your news on video, then the latest currency news is the place to go, with updates three times a day. In addition, there there is a live news feed, and for the latest prices, live currency charts covering over 70 of the world’s most popular trading pairs. Finally, if you would like help with choosing your ECN broker, I have provided some guidance and suggestions for you, which I hope you find useful.